1. Spread out. There's no point in bunching up during the crystal making stage. 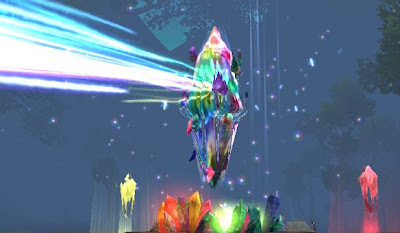 Aim to have about one person between each two crystals. 2. Don't worry about making a big green crystal until the count is up to double digits. If you make it earlier, you might as well turn it in for the count because it will despawn in the time it takes you to get to 20. 3. Make a big green crystal when the crystal count is between 10 and 20 and be sure to save it near the green and purple crystals where the boss will spawn. 4. Crystal eaters. If a player is strong enough, you can just have them gather all of them and safely ignore the crystal so you don't waste time killing them. 5. When the boss is spawned, move the big green crystal onto him to receive a 3-min group buff for a few thousand attack power. Pro tip: Only the big green crystal will make your GL go faster, all the other crystals are practically useless. Don't attack the boss until the green crystal is moved to him and the buff is received. Attacking him makes it much harder to align the crystal. 6. The cyan crystal is only useful if the boss has a lot of attack or defense buffs up. 7. Like most instances, a wind bard will make things go faster. That's about it. Happy gem hunting!